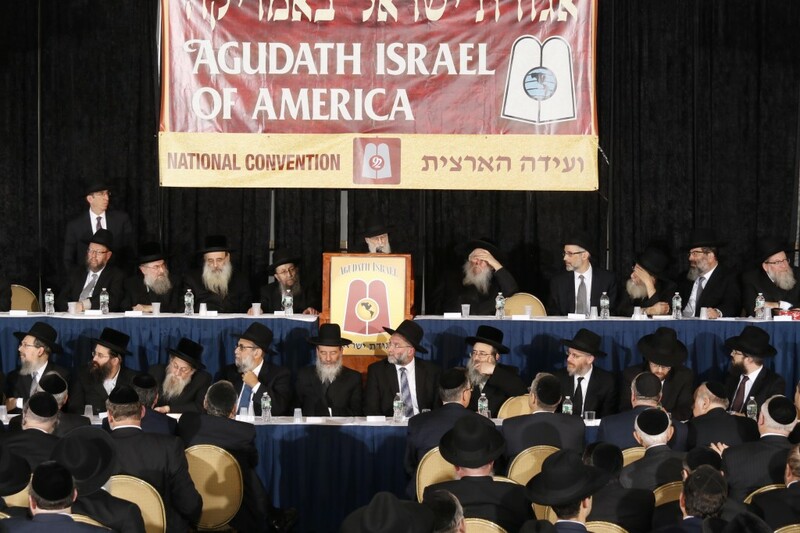 Harav Avrohom Chaim Levin, shlita, addresses the Thursday night plenary session of the 92nd convention of Agudath Israel of America, held at the Hilton in Woodcliff Lake, New Jersey. 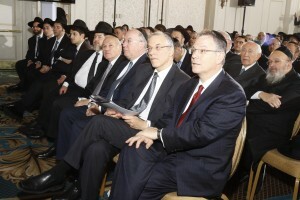 The Dais at the Convention. Mr. Shlomo Werdiger and Mr. Shlomo Chaimowitz. 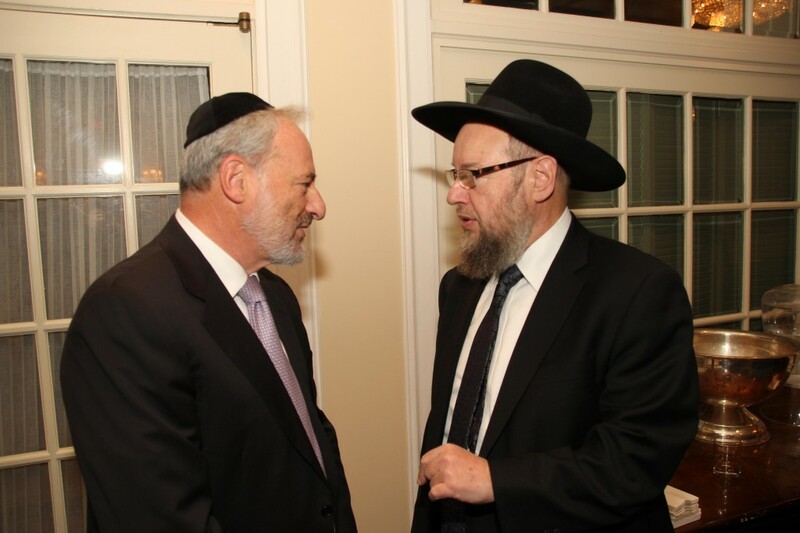 Mr. Ralph Rieder speaking to Rabbi Shmuel Bloom. A partial view of the crowd. Harav Yaakov Bender, Rosh Yeshivah of Yeshivah Darchei Torah, Far Rockaway NY. 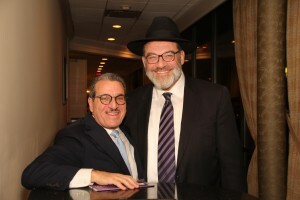 Gedolim and askanim, businessmen and rebbeim mingled as the 92nd annual convention of Agudath Israel of America commenced Thursday, with a focus on the individual’s responsibility to Klal Yisrael and an answer to the timeless question, “What’s on your mind?” It took place at the Hilton Woodcliff Lake in Woodcliff Lake, N.J. 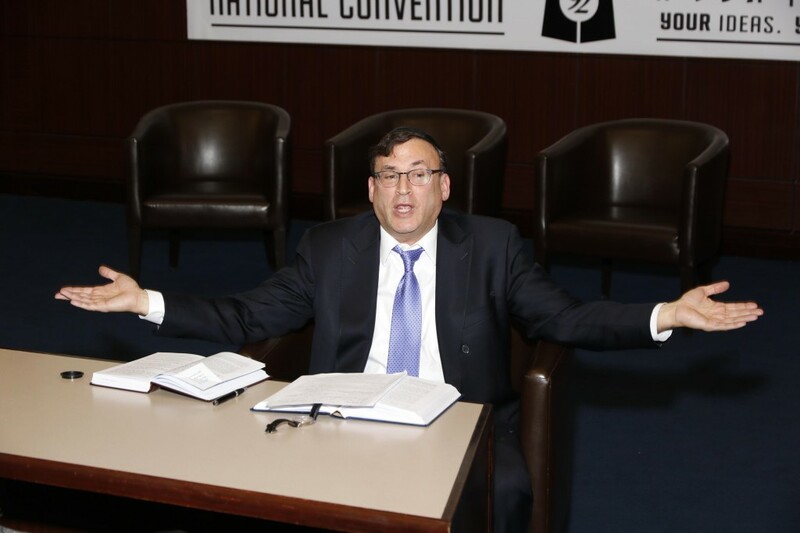 The plenary session of the convention on Thursday evening was chaired by Rabbi Mordechai Levin, administrator of Brooklyn’s Bais Yaakov Academy and a son of Harav Avrohom Chaim Levin, shlita, Rosh Yeshivah of Telshe-Chicago and a member of the Agudah’s Moetzes Gedolei HaTorah. Harav Levin began the evening’s official proceedings by citing his Rosh Yeshivah, Harav Elya Meir Bloch, zt”l, of Telshe. 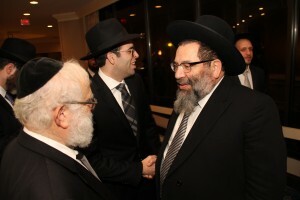 Harav Levin, a member of the Moetzes Gedolei HaTorah, citing Rav Chaim Volozhiner, zt”l, who wrote that a Yid was created not only for himself but to benefit others. 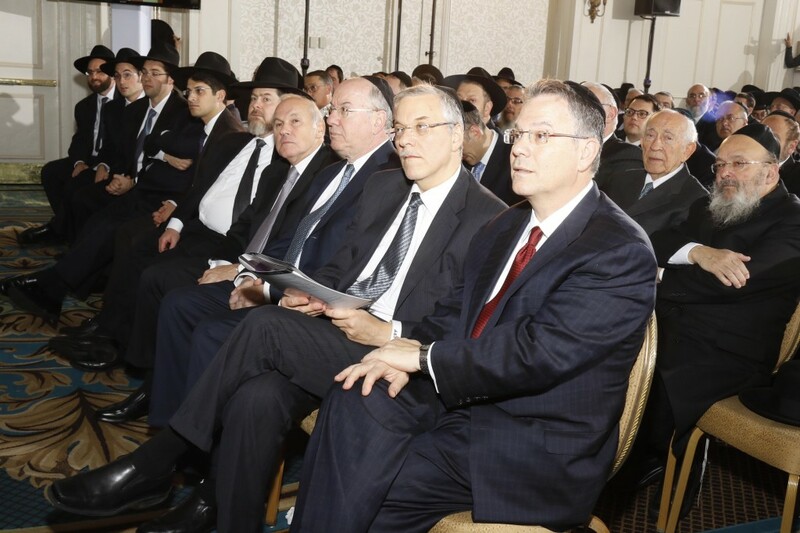 His aim should be to join with others in solving the problems of the tzibbur — in his country and in Klal Yisrael, and to perfect the world under the dominion of the Ribbono shel Olam. Working for others is the foundation of the life of a person. Harav Levin said that the Telshe Yeshivah was built on these ideals and sought to produce such talmidim. The Rosh Yeshivah quoted Rabbeinu Yonah, who wrote that each Yid is a shaliach of Hashem to ensure that others also carry out the will of Hashem. He seeks to be mechazek others — not only to learn himself but also to see to it that others are immersed in the dvar Hashem. Harav Yecheskel Levenstein, zt”l, Mashgiach of Mir and Ponevezh Yeshivos, taught that the concept that “Metalmidei yoser mekulam” — that one gains from his talmidim implies that one will gain from giving over to others, for that is the tachlis hachaim. This charge holds true especially in these challenging times of Ikvese Demeshicha, in these times just before Moshiach’s arrival. The Gemara in Sanhedrin, however, provides guidance on how to be saved from the travails of these difficult times — occupy yourself with Torah and chessed. 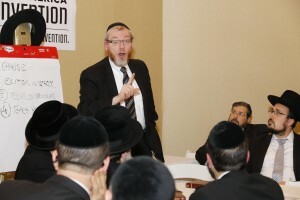 By doing so, one becomes a “Klal Yisrael Yid,” and therefore has a share in the zechuyos of Klal Yisrael. Harav Levin concluded by citing sefer Mesillas Yesharim who writes on the middah of chassidus that Hashem loves the ro’eh ne’eman — the faithful shepherd who endeavors to care for the flock of Klal Yisrael and seeks their welfare and blessing. The Rosh Yeshivah noted that Agudath Israel has always filled the role of the ro’eh neeman in its valiant efforts to serve the multifaceted needs of Klal Yisrael throughout its history. Harav Noach Isaac Oelbaum, shlita, and Harav Yissocher Frand, shlita, on Thursday night also addressed the convention, which is scheduled to go through Sunday morning. The session also included a video tribute to the memory of former Agudah chairman Reb Elimelech Gavriel (Mike) Tress, zt”l, marking the passing this year of his wife, Mrs. Hinda Tress, a”h. The convention will feature dozens of addresses and workshops throughout the four-day weekend. One highlight, at the Motzoei Shabbos session, will be the address of Rabbi Yosef Mendelevich, a former Soviet refusenik who today chairs the Od Avinu Chai Foundation in Eretz Yisrael. A more comprehensive report on this session, as well as on the rest of the convention, will, iy”H, appear in the weekly edition. This article appeared in print on page 1 of the November 14th, 2014 edition of Hamodia.